Thankfully, I have possibly the ideal neighbours for a speaker reviewer. They are sweet people who are mostly out during the day, and should they be home when I am testing stuff, they don't seem to mind a bit, even if I'm shaking the wall of our semi-something with kit simply not meant for folks who share brickwork with others. Just as well, as the Cerwin-Vega!s reviewed here seem to celebrate anti-social behaviour. Indeed, it's a trait of the company. For instance, many years ago a film called Earthquake was distributed to movie theatres, with the caveat that they had to be specially equipped with a low-frequency Cerwin-Vega! speaker system called Sensurround. Earthquake was intended to scare, and the audience really did get some building resonance during the movie. I went to see it as a child and it clearly had a profound effect on my audio-visual development. More evidence of Cerwin's belligerent attitude could be seen at this year's Consumer Electronics Show. Tacked onto the Cerwin-Vega! booth was a genuine threatening letter from the organisers warning them that if they persisted in disturbing the business of those around them, they'd have their power cut. The Cerwin-Vega! CLS series is a product built around big cones. The front CLS-12s are so called because they have a 12in driver, plus a 6.5in cone and a 1in fabric dome tweeter with Ferro fluid cooling. 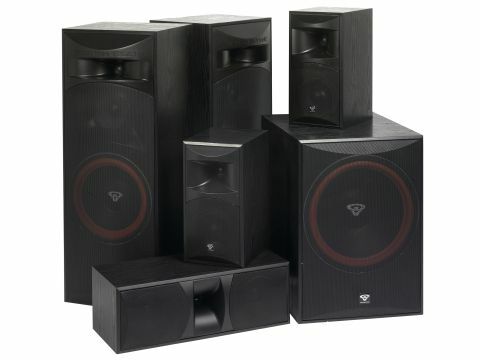 These mid- and high- frequency speakers live in shallow flared horns described as waveguides. The centre and rears are more sensibly sized with the same 6.5in fibre impregnated paper midrange cones and 1in horn-loaded fabric dome tweeters. The 250W RMS active subwoofer has a 15in driver. Cerwin-Vega! is serious about raising the roof. My son has a fascination with Japanese animation and is building a nice collection of the Miyazaki feature films on DVD, including the 2003 Oscar-winner Spirited Away. This has a mad selection of characters and deeply complex plot but, best of all, a soundtrack that is gorgeously recorded; very rich and dynamic and filled with some huge SFX. There's an outsized baby character in one sequence (around 1hour, 20mins in) who stomps around and whose feet make the room shake - well, they certainly did with this lot of audio GBH connected. This CLS system has enormous scale and feels as though it has fabulous efficiency. The level of low bass that emanates from the main left and right speakers is huge. After all, each front channel has a long-throw subwoofer driver fully 12 inches across, as much as some systems have for their whole LF output! Yes, the metal grilles might look a bit industrial and the Cerwin-Vega! logo sunk into the moulding serves to make the kit look a bit 'pro audio', but the tinkly highs and potent midband that come from these speakers is remarkable. This equipment isn't terribly high end; it isn't even pretending to be. There's no out-of-box acoustic holography going on, with images hanging in the space between the enclosures. Rather, you get neat and accurate steering and tremendous detail retrieval. Clumsy for hi- fi, but cracking for movies. At first, I was a little underwhelmed with the performance of the subwoofer, as with all the Sensurround hype, I was expecting it to rattle my bones and drop as deep as a snake's belly. However, this stuff is designed for a buyer who cranks the hell out of his gain controls. The subwoofer does make some excellent low tones, with real grip and a deep ported tuning. But, even with the gain up full, it really wants a signal the size of a tank shell detonation to excite it. In many cases, I have found Miyazaki's bass soundtracks are able to really mess with well-set subs. Howl's Moving Castle will destroy your woofer when it moves if your system is not set pretty low down. The Cerwin-Vega! approach is to offer 'enough' for the time being but have the headroom to really push some air when mayhem breaks out. Put simply, it's as subtle as a pair of surgically augmented HH silicone breasts - but probably every bit as engaging to the average red- blooded geezer. Overall, I'd rate Cerwin-Vega! 's CLS system as a treat for action movie fans and those who really get off on trashing Terminators, big explosions and angry gunplay. Almost a speaker system for the megalomaniac. I really rather enjoyed them... and I'm hoping my neighbours did, too.